Social media account management, collaborative research projects, and event leadership for the RISD Glass Department. Posts from the RISDglass Instagram. From left to right: A whistle encased in hot glass is torched to remove the punty mark. Artist Demetrius Oliver looks on in the background; Naomi from the Making and Kowing Project analyses a test melt during Alchemy: Making Ruby Glass; The kiln door is opened during one of Brett Swenson's experiments to reveal a strange glass inflating at high temperatures. 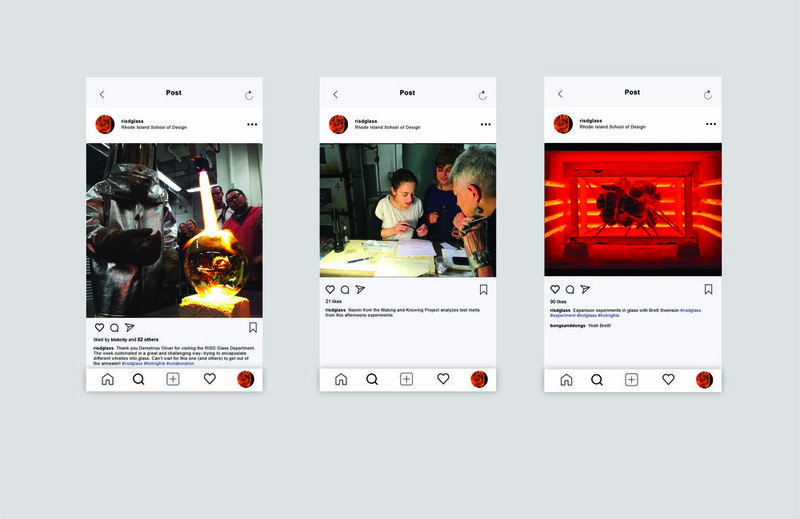 I created the RISD Glass Instagram account in 2015 as a Post-Bacc student in the glass department. I was frustrated with the lack of media presence and made the decision to start posting and promoting RISD Glass, the shop's unique culture, and all of the cool projects and people who passed through. The account took off, gathering followers ranging from private individuals to museums, companies, and professional artists and designers from around the world. Research in RISD Glass takes many different forms, from special studio courses, to semester-long sequences in the Hotshop, to extended work with visiting artists. Among the projects I was involved in were Alchemy: Making Ruby Glass, Synthesis of Light, Material Nature, and Writing Glass with Jen Bervin. More details on all of these projects can be found here.